Indicated for rebellious and wavy hair, to reduce the volume with the alignment of the hair, in addition to providing extra gloss and softness. Modifies the structure of the hair fiber temporarily with the alignment of the yarns for a smooth effect while restoring the damaged cuticles and fills the areas with loss of mass, which leaves the hair more full-bodied, disciplined, shiny and soft. Vegetable Oils Mixture: Mixture of 12 precious oils obtained from nuts, seeds, herbs and fruits such as Argan, Shea Nut, Cotton Seeds, Coconut, Macadamia, Green Tea, Chamomile, Aloe, Calamus, Myrrh, Olives and Cinnamon . Discipline and control of frizz. Smoothes dryness and dehydration of hair. Provides excellent emollient and lubricant properties, providing silky feel and softness to extra-dry and rough hair. 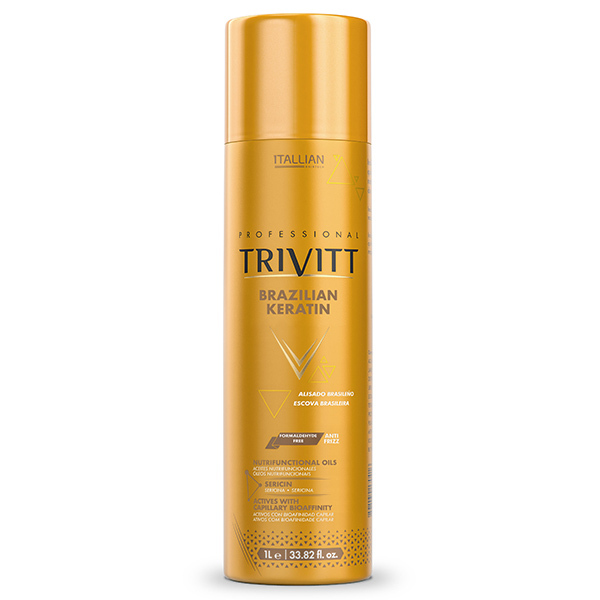 Helps to model hair and fight frizz, as well as promoting FAN SEALING, protecting it from external aggressions. Rich in VITAMIN F, the cottonseed oil has excellent emollient, nourishing, protective and restorative properties of the hair. Restores the natural elasticity of hair, as well as acting as TRUE ANTI-RESISTANCE SHIELD. The curative and highly regenerative action helps to preserve the INTEGRITY OF HAIR FIBER. Rich in fatty acids, omega 9 and omega 6. Fatty acids act by preventing the loss of capillary hydration. Provides deep nutrition and helps restore the natural flexibility of hair. It has ANTI-OXIDIZING action on the hair fiber exposed to the external aggressions, besides promoting hydration, softness and softness to the dried wires. The powerful properties of cinnamon can be useful for toning the circulatory system of the scalp and sanitizing the entire capillary system. Cinnamon oil is AROMATIC, ANTI-SEPTIC AND STIMULANT OF SENSES. Characterized by triglycerides with high content of oleic fatty acid. Olive oil is rich in emollient and nourishing agents that restore the natural flexibility of dry hair. Nourishes hair and helps control volume and frizz formation. It has regenerative action and gives a healthy appearance to the hair. It is a substance rich in omega 3 and 6, polyunsaturated fats considered “good” and that have POTENTIAL HYDRATION and reconstructor for the wires. It has high content of lauric acid, myristic acid and caprylic acid, among others. It is an EXCELLENT CONDITIONING AGENT without rinsing the hair if applied in small amounts at the tips, with clean hair. Strengthens, SOAKS AND HYDRATES HAIR while maintaining their integrity. EXCELLENT NUTRIENT, with important PROTEINS, VITAMINS AND MINERAL SALTS. It allows hair penetration and carries important nutrients into living cells. Aloe leaves are rich in moisturizing agents. Antioxidant action due to the presence of polyphenol. Green tea also has manganese, potassium, folic acid, vitamin C, vitamin K, vitamin B1 and vitamin B2.